More painting, this time for my husband's birthday cake, since the cake was very light and creamy, I made the decoration separately, bigger than the cake and just stuck it over (glued in place with royal icing). It's hard to believe that's all edible! 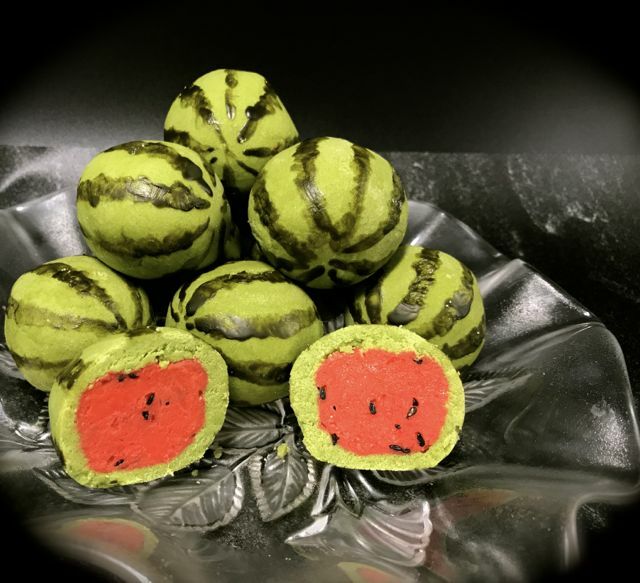 Green tea skin, custard filling (with red food colouring), watermelon "seeds" are black sesame seeds. I had to google snowskin mooncakes as I had never heard of them. Sounds tasty! The subtle pink coloring on the edges of the petals is a nice touch.